Watch the Cheech and Chong Smoke-A-Thon this Sunday, Dec 31st at 2PM est on Comedy Central. The marathon will feature three C & C movies. All times are eastern standard time. Up in Smoke will also be on Comedy Central Saturday at 8PM est. Click on the movie titles above to purchase uncensored versions. Up in Smoke and Still Smokin are now on DVD. We've decided to relist two items that winners neglected to pay for. • Wedding Album LP - Album looks like an actual wedding album. C and C are siamese twins in the photos. Their wife is wearing a paper bag. Cheech Marin just started shooting a new motion picture starring Antonio Banderas, Johnny Depp and Mickey Rourke. Once Upon A Time In Mexico is about a drug lord who pretends to overthrow the Mexican government. Its status is "in production" and currently scheduled for a 2002 release. Here it is, folks: Our pre-summer discount blowout. Everything in the store, everything, has been discounted up to 30%. Not only that, but we're also offering a coupon for $5.00 off a minimum purchase of $19.95! So, if you want to stock up on Cheech and Chong music and movies for the summer, this is definitely the way to go. Offer ends June 25, 2001 at 11:59 PM, EDT. The $5,00 is automatically deducted when checking out. Does not apply to out-of-print special requests. Tommy Chong will headline this summer's World Hemp Festival. The event takes place July 20th-22nd in Harrisburg, Oregon. Tommy is expected to perform his stand-up act. Click here for the complete festival schedule and ticket information..
We're excited to announce that Things Are Tough All Over and Nice Dreams are coming to DVD June 12th. Thru a special arrangement with CDNow, you can pre-order these movies at a special discount. We are unaware at this time whether or not these DVDs will have extras, such as deleted scenes. Cheech Marin's latest film, Spy Kids, raked in $27 million this weekend, making it the number one movie in America. Antonio Banderas and Carla Gugino play spies who come out of retirement and vanish. The only people that can save them are their kids. Cheech plays Uncle Felix a spy sent to protect their children. However, Uncle Felix soon becomes involved in the saga. Cheech Marin's latest film, Spy Kids, opens March 30th at theatres everywhere. Antonio Banderas and Carla Gugino play spies who come out of retirement and vanish. The only people that can save them are their kids. Cheech plays Uncle Felix a spy sent to protect their children. However, Uncle Felix soon becomes involved in the saga. Being There, the hysterical Peter Sellars movie, is coming to DVD in April. Why are we telling you this? Good question. The answer is: Cheech and Chong are in it, in cartoon form. The movie is about a guy who lives in isolation and is educated by television. There's a scene where Peter Sellers turns on the TV and watches a cartoon short. The cartoon is the sketch Basketball Jones, from Cheech and Chong's infamous Los Cochinos album. This is the only place you'll see this cartoon. WE HIGHLY RECOMMEND PICKING IT UP. It's essential for C and C fans and available on both DVD and VHS. Advance order this movie and get a special C & C Dot Com discount. After posting yesterday's story on the reshooting of Best Buds, we found this article from Canada's Online Explorer (Canoe) magazine which provides more detail, as well as an interview with Tommy Chong. The article dated September 12th, 2000 states that the lawsuit against Coyote Films was settled out of court and that Tommy Chong is now in possession of the original reels. He planned on reshooting the film by the year's end (2000). The status of the proposed re-shoot is unknown. In the article, Tommy refuses to reveal who the new Cheech is. He only says that he's a longtime friend and that his name is Francisco. As mentioned in our earlier article, we discovered that Cheech will be played by newcomer, Francisco Vasquez. He previously played a salsa dancer in a movie named Dance With Me. This is an unconfirmed rumor...An anonymous source tells us that Tommy Chong has found a new Cheech and is re-shooting the never-released Best Buds film. Cheech will be played by relative newcomer, Francisco Vasquez. He previously played a salsa dancer in a movie named Dance With Me. History...We last heard that Tommy had creative differences with Best Buds funder/director, Ken Kuramoto. Kuramoto runs a low budget film company named, Coyote Films. Tommy was unhappy with the final product and was suing Coyote Films to retreive the original reels so he could re-edit the film. If this rumor is correct, then it sounds like Tommy has taken matters into his own hands and starting from scratch. 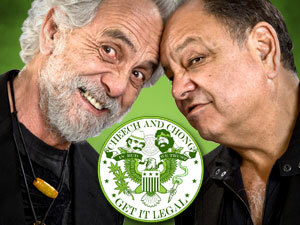 In our opinion, Tommy Chong is a genius and we are very psyched that this film may actually see the light of day.